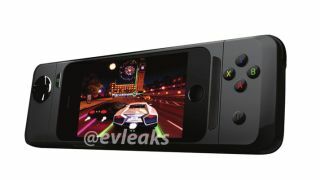 iPhone gamepads are becoming a very big deal indeed since iOS 7 brought in a gaming API, and gaming giants Razer could be the next manufacturer to jump onto the bandwagon. With the likes of GTA: San Andreas for iOS set to support game controller add-ons, the pad peripherals are going to proliferate in the coming months, and a leaked Razer 'Kazuyo' add-on has appeared on the @evleaks Twitter feed. Having come away from some time with the MOGA Ace Power for iPhone feeling a little non-plussed, we're keen to see some other options - although the lack of joysticks on the Kazuyo is not exactly thrilling us either. You can use your swanky D-Pad to navigate to more of these blips.